Mystery Bag Storytime is a great ESL game to use in your high school or adult classes. It combines: Listening, Speaking and Vocabulary building skills. Ages - this game requires higher level vocabulary so I suggest using it with high school & adult students. Time - This game can last anywhere from 5 to 20 minutes depending on the size of your class and how many items you place inside the Mystery Bag. Class Size - This game works great with anywhere between 3 and 10 students. Anymore than that and I would suggest breaking your class into groups. Fill a Mystery Bag (a.k.a. Feely Bag) with as many random items as you can. At least 1 item per student. Have your students make a circle. Begin your story by saying something like: "Along time ago in a galaxy far away.......". or "Let me tell you about my weekend.......", etc. Reach into the bag and pull out an object. Use that object to add a line (lower ability level) or paragraph (higher level) to the story you already started. Pass the Mystery Bag clock wise and have the student next to you another item out of the Mystery Bag and then add another line (lower ability level) or paragraph (higher level) to the story you already started. Continue this process until the Mystery Bag goes all the way around the circle. When it comes to learning a second language, one of the biggest hurdles to leap is its nuances. Most people can master a vocabulary term here or there, but it is items like verb tense and contractions that make the practical use of the language much more difficult than one might at first expect. This is especially true of English, which has many formal grammar rules that can be confusing or contradictory when the language is spoken or written casually. For non-native speakers, these rules, which are often broken in casual situations, can make mastering the language more challenging. Fortunately, there are several tricks that can help you overcome some of the more confusing aspects of grammar—and perhaps even help you speak better English than native speakers. Verb tenses are an important and central part of many languages because they signal to the listener or to the reader when an action has happened or will happen. With that said, verb tense is an aspect of grammar that many people (including both native and non-native speakers) struggle with. Verb tense becomes even more complicated when you realize that, in English, there is more than one present tense. While there are many elements of verb tenses that can be downright confusing, we will focus on consistency. Consider this passage: “She was walking through the park. A stranger stopped her, and asks, ‘How do I get to Main Street?’” This is an example of improper use of verb tense because “She was walking through the park,” is in the past tense, but “A stranger stopped her, and asks, ‘How do I get to Main Street?’” is in both the past and present. If you are unsure about how to remain consistent with your verb tenses, always consider when the action that you are describing happened, and then remember that all other actions in the passage must happen at the same time. When you wish to change “it is” into a contraction, you simply place an apostrophe between the t and the s to form “it’s.” Using the word “its” without an apostrophe is not a contraction, but instead a possessive pronoun because you are attaching a thing (“it”) to something else. For instance, “The dog wagged its tail,” calls for the possessive form (“its”) because you are talking about the dog’s tail. (In other words, the tail belongs to the dog.) If you are ever unsure about which to use, ask yourself, “Do I want to say ‘it is’?” If the answer is no, then you most likely want to avoid the contraction. ESL games are supposed to be easy and fun. However many new language teachers run into problems when trying to introduce new games to their students. It’s not that the game is bad. It’s not that the students are bad. Most times if an ESL game is unsuccessful in class it’s simply because the teacher didn’t introduce the game properly. Make sure the students are paying attention . Do not let your class touch any game objects while you’re explaining the game. Kids get distracted very easily, it’s much better to keep the objects visible but away from them. Keeping the objects visible sparks curiosity which will in turn make it easier to set up the game. Demonstrate the game as easily as possible. 1. Use the simplest instructions and the least amount of English you can. Once the students comprehend the game you can add the language later on. 2. Play the game by yourself. 3. Play the game with a stronger student. 4. Slowly bring other students into the game. 6. Start the game properly. As a teacher you have to remember to relax. If your having fun the class can sense it and will follow your lead. ● The game is practice at English. Students don’t have to be perfect. ● Different students have different abilities. Make sure your game is level appropriate. Better students should have harder objectives so that they don’t get bored. Lower students should have simpler goals so they don’t get discouraged. ● Winning doesn’t matter. Keep points to spark competition but the second the game is over everyone forgets the points anyways so don’t stress about them. ● If you’re playing against them...DESTROY THEM. Not with the English but with the game. Be the best ESL UNO player you can be! That way if, and when, they beat you it means more to your students. Remember EVERY GAME GETS BORING. If your classes behavior is starting to slip, quit the game as soon as possible. If you finish a game while the class is still having fun they’ll beg to play longer. If you let it go on too long, they’ll never want to play again. The first day of any ESL / EFL class is always a little bit hectic. Student's always have a lot of curiosity about who their new teacher is. As a new teacher, my first class of the year often turned into an hour-long monologue about who I was and where I was from. It was an introduction but there was no lesson. The students weren't engaged or participating. While attending an English Teachers in Japan conference last year I attended a presentation given by the ETJ founder David Paul. For his introduction he had the class completely engaged in a guessing game as we pieced together scattered bits of information about him until we had figured out who he was. How do you do it? It's simple! 1. 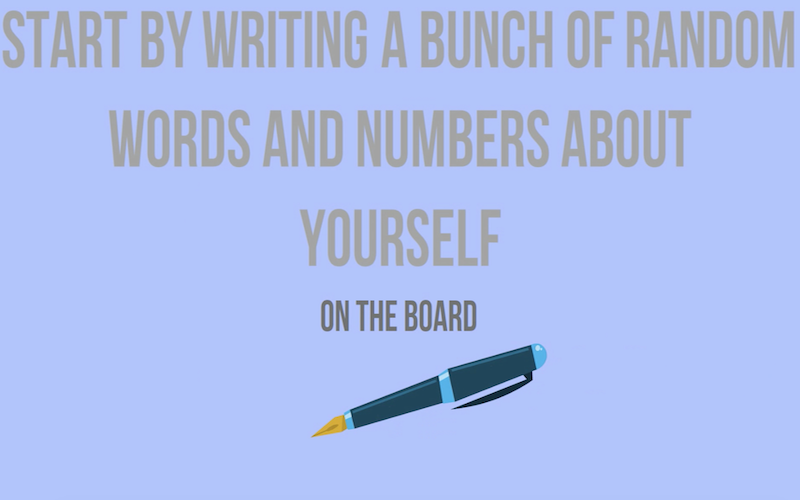 Write 10-15 random words and numbers about yourself on the board. 3. Work with the class as they guess the meaning of each word and number. This introduction ESL / EFL activity is so simple it can't fail. If a student guesses correctly, expand on their answer and tell them an extra little tidbit about yourself. It's more than likely they'll ask you follow up questions as well. If the class guesses incorrectly there's still plenty of extra conversation and engagement opportunities after their incorrect responses. Best of luck with your new classes in 2016! As any language learner quickly realizes, what you encounter in a book or in a classroom, and what you encounter in the “real world,” can be very different. Thus, book learning alone is unlikely to lead to fluency. A great way to overcome this challenge is to identify a person or a group of people with whom you can practice the practical application of your skills. This peer support can occur in a more formal environment, like a campus language group, or in a less formal environment like a dinner with friends. Aim for a mix of native and non-native speakers who can help you grow your abilities and feel supported in your endeavor. The saying “Practice makes perfect,” may be well worn, but it is well worn for a reason—it is true. If you hope to improve your language skills, you will need to apply them often and in various contexts. Think of places where you can practice, like casual public speaking engagements, restaurants, or other creative outlets. Language works differently in different environments, so by varying the areas in which you practice, you may find one that is very effective. Like speaking, learning to write in a second language can be challenging. We tend to write differently than we speak, and there are often more rigid rules for writing than there are for speaking. If you are an international student, you are likely required to write in your second language on a regular basis, but academic writing is only one type of writing. So, look for other opportunities, especially those that are outside of your comfort zone. For example, if you are confident in your technical writing abilities, set a resolution that you will find a number of opportunities to practice your creative writing in the coming year. This may seem like an obvious goal (and it may even be one that you are already addressing), but that does not mean that it is not important. A strong command of any language requires a well-developed vocabulary that extends beyond that in textbooks or language apps. Perhaps you decide to set a goal to learn a specific number of new words each month, ideally across multiple contexts. For example, you might spend one month learning 10 new words that are commonly used in your field of study, while next month, you focus on 10 phrases that you might use in a doctor’s office. It is often said that English is a difficult language to learn, which is in part due to the slang, idioms, and colloquialisms that we use regularly. These aspects of the English tongue can defy the basic rules of the language, effectively confusing non-native speakers. Given this fact, you might set a goal of improving your understanding and use of humor and slang by practicing with native speakers or by watching television series and films.